As Roger Goodell loves to remind everyone, any discussion of the Oakland Raiders moving to Las Vegas is still premature. That apparently won’t stop more and more NFL owners from weighing in on the issue — and while not all of them are outright supporting the idea, most are keeping an open mind. Monday Morning Quarterback recently asked John Mara of the New York Giants, Bob McNair of the Houston Texans, Jeffrey Lurie of the Philadelphia Eagles, Jed York of the San Francisco 49ers, and Woody Johnson of the New York Jets for their opinions on a potential Raiders move to Vegas, and all five said that they were at least open to the idea. Both McNair and Johnson seemed enthusiastic about the idea, with the Jets owner calling Vegas a "very exciting market" and McNair outright stating that he would "look favorably" on the move. Mara, Lurie and York, on the other hand, were mostly ambivalent, claiming that they’d prefer to wait for an actual proposal to be on the table before fully considering the relocation. All five seemed to be in agreement that gambling would not be the biggest roadblock to a team in Las Vegas. 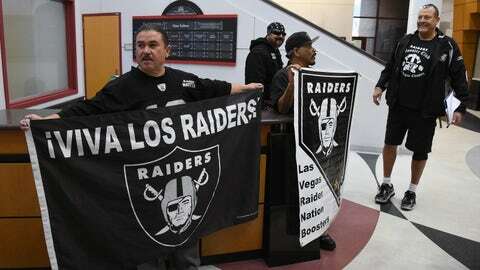 Instead, the owners are more concerned with southern Nevada’s ability to support a professional franchise. Would there be enough fans in Vegas to make an NFL team there a good idea? For what it’s worth, the Las Vegas metropolitan area is the 29th largest metro area in the United States, according to US Census estimates. That puts Vegas ahead of NFL cities such as Green Bay, New Orleans, Nashville, Indianapolis, Cleveland and Kansas City. But all of those cities (save Nashville, perhaps) are established NFL cities with diehard fanbases. Vegas would be trying to build from scratch. Whether you can organically build a football tradition in a city that depends almost entirely on tourism should be a major concern. But if there’s money to be made, NFL owners will surely come to the table and consider all the options. Along with McNair and Johnson, Dallas Cowboys owner Jerry Jones and New England Patriots owner Robert Kraft have previously expressed their belief that the Raiders moving to Las Vegas would benefit the league. Atlanta Falcons owner Arthur Blank, meanwhile, has expressed a similar outlook as Mara, Lurie and York, claiming that he believes the gambling aspect of Las Vegas can be contained and that the city’s viability as a market is the major consideration. Raiders owner Mark Davis has pledged $500 million to a potential stadium in Vegas, and Las Vegas mayor Carolyn Goodman has expressed extreme optimism that the team will end up in Las Vegas.